The weather conditions in the formerly “safe” growing areas of Italy and Spain are becoming increasingly extreme. 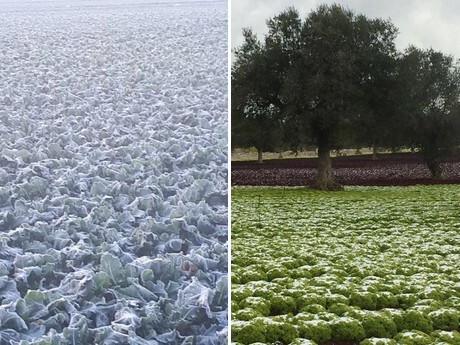 Italy is struggling with considerable snowfall, parts of Spain have to deal with frost. Even if it only turns out to be a short period of frost or snow, the consequences are already noticeable within wholesale. Regarding the current harvest, there are quality and yield losses, especially for the vulnerable leafy lettuces. Growers and retailers are worrying about the remainder of the harvest. 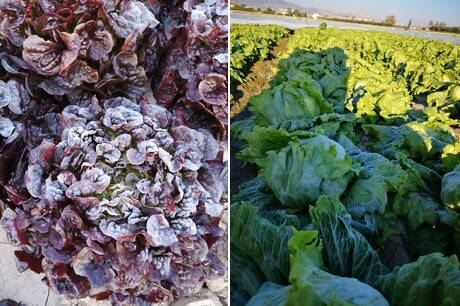 In Spain, iceberg lettuces is affected in particular, in Italy it is mainly the colorful lettuces (Lolo Rosso & Bionda). Classic winter lettuces such as endives and radicchio, on the other hand, are holding up somewhat better. But there will also be losses in this area if the weather stays the same. The same applies to vegetables such as eggplants, peppers and tomatoes. In some cases, however, alternative sources like Morocco and greenhouse products from the Netherlands and Belgium could be used to fill the gaps. “Last year, Spanish zucchini, for example, also saw a short supply and extreme price increases,” recalls Savarese.